A That portion of Unit 108 north of the Falcon to Gonder powerline. B That portion of Unit 108 south of the Falcon to Gonder powerline. Special Regulations: Eligibility restrictions concerning successive years’ hunts as stated in NAC 502.361 do not apply to this hunt. Depredation Hunts are intended to drastically reduce elk numbers. Poor hunter success expected. * Interstate hunt with Utah. Nevada and Utah hunters may hunt in Unit 091 in Nevada and the Box Elder, Pilot Mtn Hunt Boundary in Utah. Nevada hunters hunting in Utah must abide by Utah regulations. C That portion of Unit 113 north of White Pine County Road 35. A That portion of Unit 072 within the Jarbidge Wilderness boundary. B That Portion of Unit 162 within the Table Mountain Wilderness boundary. C That Portion of Unit 222 within the Mount Grafton Wilderness boundary. D That Portion of Unit 231 within the Fortification Range, Parsnip Peak, and White Rock Range Wilderness boundaries. The Nevada Board of Wildlife Commissioners has passed regulation prohibiting the taking or gathering of shed antlers from public land in Elko, Eureka, Lander, Lincoln, Nye or White Pine counties from January 1 – April 30 each year. * Low elk numbers in the area. Depredation Hunts are intended to drastically reduce elk numbers from this Unit Group. Poor hunter success expected. A That portion of Unit 081 within Elko County bounded on the west by the Fall Creek Road, on the north by the Idaho state line, on the east by the Utah state line, and on the south by the Signboard Pass-Thousand Springs Road and by State Route No. 233 from Montello to the Utah state line. B Those portions of Elko County southeast of the Cherry Creek Road and southwest of U.S. Highway 93, and that portion of White Pine County west of U.S. Highway 93, north of White Pine County Road 27 (Bassett Lake Rd. ), and east of White Pine County Road 27 to its junction with White Pine County Road 18 to its junction with White Pine County Road 23 (bench road from Bassett Lake Rd to the town of Cherry Creek) to State Highway 489 0.2 miles east to its junction with White Pine County Road 25 to the Elko County Line. 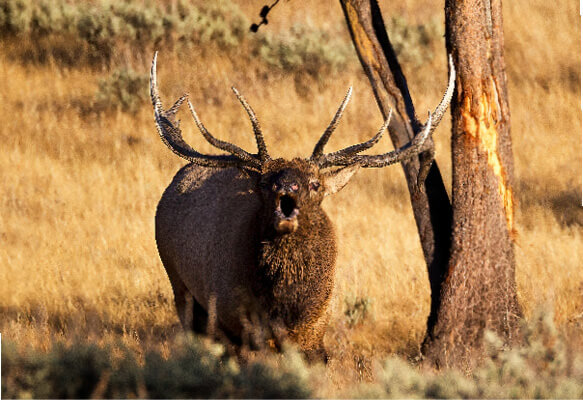 Applicants can apply for both antlered and antlerless elk in the same draw period. Additionally, if a person is interested they can apply for multiple antlerless elk hunts in the same draw but only draw one antlerless elk tag. An applicant is able to apply for both antlered elk and spike elk. However, they will only be able to draw one of the tags. Be advised that once a tag is drawn the other application becomes unsuccessful. There is the possibility an applicant could draw the spike tag instead of an antlered elk tag.